Satin Pillows and Bonnets for Hair Protection! *Disclaimer: I am not advising towards or advocating anyone to stop wrapping up their hair at night. This is merely an account of a carefree natural! Greetings, my lovely people! It has been a while since I dropped in, as usual, but I do have quite a bit of updating to do along the next couple of days! I have added some brand new items to the Hair Garden Nursery and I have also revisited and restocked some items from the past!! The first set of Hair Garden’s hair care items I want to share are the new sleep care accessories! I decided to break in my sewing machine and have created lovely satin-lined pillows and bonnets to protect your hair while you rest! Personally, I DO NOT wrap my hair at night unless it is completely necessary. In the past, I couldn’t sleep well unless my hair was secured. However, time passed and I would occasionally go to sleep without securing my hair, especially in the warmer months! There would be some nights where I would awaken suddenly from discomfort only to find that my scarf was soaked with sweat therefore causing my hair to be damp with sweat. That defeated the purpose of protecting my hair style overnight, right? After a few of those occurrences, I stopped wrapping my hair at night and I loved it!!! It has been about 7 years since I last tied my hair on a regular basis. With the assistance of satin pillowcases, I was able to pull off avoiding that nightly routine. Occasionally, I would wear a bonnet or wrap if the hair style absolutely called for it. Now, we all know that I love my African fabric! I acquired some lovely material when I visited Ghana last year to make my own pillows, headwraps and other crafts but had a time getting to know my sewing machine! After a break and determination I got that machine running and started my pillows and bonnets! I started small and moved up in size. I picked the finest, high-quality satin I could find to go with the African fabric and the rest speaks for itself! I am proud to add these lovely additions to The Hair Garden Nursery’s line-up in my Etsy shop! I offer pillowcases ranging from $15-35, full pillows range from $25-50. All offer free shipping for a limited time! Check out some customer photo submissions below! Author AphropuphsPosted on November 5, 2017 November 5, 2017 Categories Hair Accessories, Hair CareTags affordable products for natural hair, african hair care, african print, african print bows, hair regimen, natural hair, natural hair care, natural hair gifts, satin bonnets, Satin pillow, the hair garden nurseryLeave a comment on Satin Pillows and Bonnets for Hair Protection! Got My Hands on More Red Palm Oil! Hello, beautiful people! I have finally gotten my hands on more of my beloved red palm oil! I ran out of it a couple of months ago and kept putting off going out to look for it. One of my students told me she was going to the local Farmer’s Market after class so I sent my request (and some cash!). The next day she brought me my rich, red goodness! It is the best heavy conditioning oil for my hair! I include it in just about all of my deep conditioning mixes. 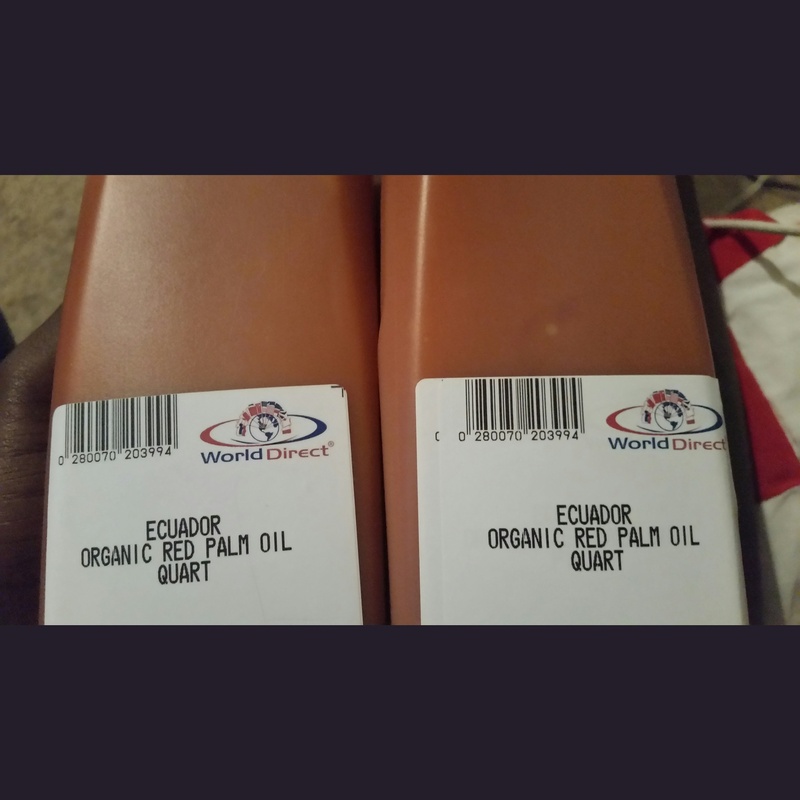 I usually always use the red palm oil from Ghana, however, I am looking forward to using this oil! The major plus is that it’s organic! At least that’s what the label says so let’s just think positive. I was so excited about my oil and just wanted to share that with you! I have a busy few days ahead of my of loving up on some curls but I will eventually get to my own and will share my latest conditioner recipe and more red palm oil info! Talk to you soon! Thanks or stopping by! Author AphropuphsPosted on July 24, 2015 Categories Deep Conditioners, Hair Care, Natural ProductsTags african hair care, african natural hair care, african oils for natural hair, ghana natural hair care, natural conditioning oil, natural hair, natural hair care, natural hair products, red palm oil, red palm oil afro hair, red palm oil for hair1 Comment on Got My Hands on More Red Palm Oil!